NO LONGER AVAILABLE No bells - no whistles. Sync time/date stamp, edit, and export your original video easily! Availability: NO LONGER AVAILABLE Free Shipping. 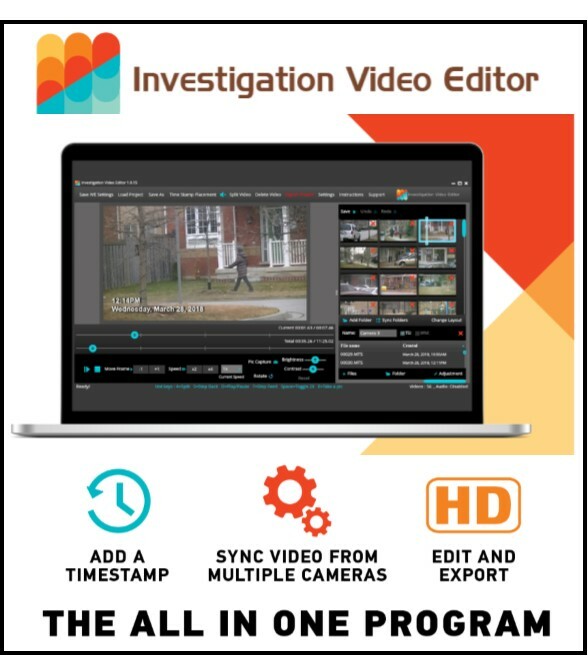 Investigation Video Editor (IVE) gives you the ability to add time-stamps to video, sync the video taken from multiple cameras, edit the video & masterfully render your final project into a true, professional-quality, uniquely branded, HD product ! IVE truly is the last piece of software you will ever need. It gives you the ability to do such things as adding design screens that list case information or a black screen between surveillance days. As well, it provides you with customizing options like attaching your company’s logo, as a video header and/or as a watermark, to the final product. With IVE you can really make your agency stand out from all others. 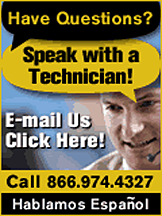 This is a one-time purchase, with no subscription or annual fees! Discount offered on multiple key purchases. surveillance videos has never been easier! 1) Buy the Activation KEY here at PIGEAR with your discount. 2) You will receive an email and activation key / serial number. 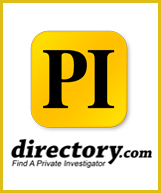 3) Go to www.investigationve.com to download the software. You will receive an automatic email upon purchase with full download instructions. 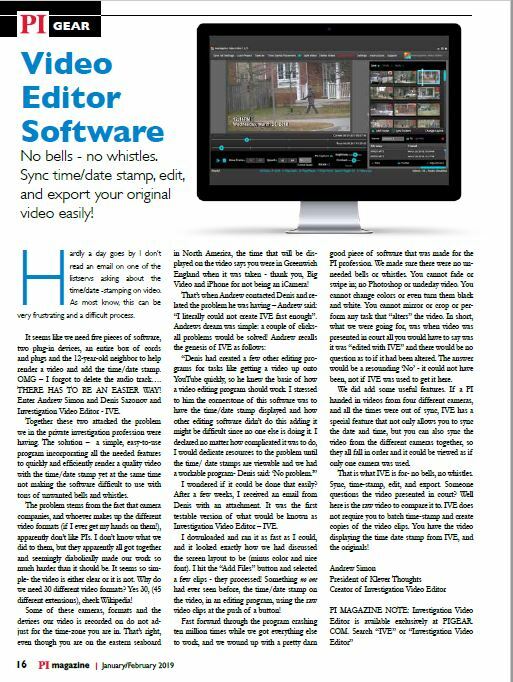 Your purchase is for Investigation Video Editor software digital version. You will NOT receive a CD or other software media other then the electronic download. Please retain both your receipt and the activation key for future reference. 2.33 GHz or faster x86-compatable processor, or intel Atom 1.6 GHz or faster processor for notebook class devices. Microsoft Windows Server 2008, Windows 7, Windows 8.1 Classic or Windows 10. Free disk space required: - 1GB or more, minimal – 4 GB or 8 GB RAM, i5 or i7 processors. Video / audio graphics card NOT required. · Take HD stills of the video. With the timestamp! · Add a company header/footer. With sound! · Skim through video faster than real time! It is incumbent upon private investigators to produce video suitable for their clients to present in court. It is a must for the video to have both the sound removed and a time-stamp displayed. 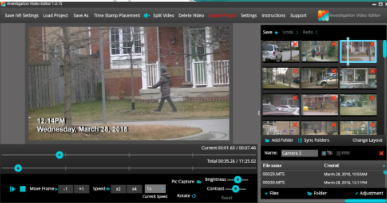 Given the complexity of a PI’s job, it’s not uncommon to forget to set the time on cameras and this is why Investigation Video Editor can be a virtual life-saver. With IVE you can adjust the date and time that is displayed on the video to reflect what is true and this feature really comes in handy where there are multiple cameras involved with times out of sync. Using IVE means you can simply and easily sync all the times of the cameras to enable clips to align in perfect chronological order for a smooth and seamless viewing experience, which can really make the difference in court. Until IVE, the potential (legal) problem was the possible manipulation of the digital stamp to reflect the wrong time or date, as many lawyers will concur. As a consequence, legal professionals will normally demand to see the “raw” video (video clips right out of the camera). To address this issue, IVE only utilizes the raw video clips, which are loaded into the program, with the date and time stamp displayed, allowing for the simple edit and removal of blurry or shaky parts, after which all can then be exported to the final product. That’s it! It is thus more acceptable in court as with IVE you cannot crop, adjust colors or photoshop items in or out of the video. What was shot is what you (and all interested parties) will see!